As we all know, we have been without a Senior Assistant of Co-Curriculum for several months. 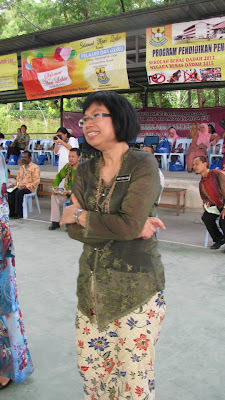 This was so as Mr. Mah See See, former Senior Assistant of Student Affairs was transferred to SMK Sultan Abdul Samad, Petaling Jaya. Hence, Mr. Wong Tzyy Yu, then-Senior Assistant of Co-curriculum changed portfolios. Hence, a vacuum ensued, within the school's administrator board, with many speculations as to who will fill this post, be it teachers or students. Where did you further your studies? I studied in Universiti Malaya. I had a Bachelor of Science degree and skipped my first year and went straight ahead to the second year, where I studied physics and mathematics and went on to become a mathematics specialist. Where did you want to further your studies? I would have liked to further my studies in New Zealand. I find it a very peaceful place, and it’s very in touch with nature. I like nature, so that would have been a pleasant experience for me. If I may, why then didn’t you further your studies overseas? Well, when I was still studying, the education system was different. There were hardly any private colleges and universities, unlike nowadays. There were mostly only government universities, such as Universiti Malaya. Getting into Universiti Malaya was seen as very prestigious, so when I was actually accepted into it, I decided to follow the course. It was an opportunity I couldn’t resist, and it felt an honour to be accepted. How many years have you been in education, and where have you been teaching previously? This will be my 31st year as an educator. Previously, I have been teaching at SMK Dato' Haji Kamaruddin, Kuala Kubu Bharu; SMK Kampong Soeharto, Hulu Selangor; SMK Bukit Gading, Sungai Buloh; and SMK (P) Sri Aman, Petaling Jaya. What subjects do you specialize in teaching? Even though I studied further in the field of mathematics, I actually do more teaching in physics. I taught mathematics for my first few years, but after I was assigned as a physics teacher, I started solely teaching physics. Why did you choose education as your career? I actually wanted to further my studies in mathematics and get a masters' degree. I was interested in doing research, writing my thesis and maybe eventually getting a doctorate. After I got married and settled down with kids, all these plans just got postponed and I decided not to pursue them any further. I decided to be a teacher because I believe it’s a noble profession. My husband works in business and I feel that I am blessed with all I’ve been given. I want to give back to society, and one way of doing this is by helping others, such as coaching students who are weak in their studies. What do you see in your future as an educator? Well, I hope to be playing an important role in educating students who come from less fortunate backgrounds. Back when I was teaching in SMK (P) Sri Aman, I noticed the students there were quite well off and could afford tuition. The students in SMK Kampong Soeharto on the other hand couldn’t afford to go to tuition and things like that. That’s why I would always try to find time to coach them. They had all the potential but no guide and no financial resources. A good student can’t excel only academically, but must understand the ways of life as well. I share life lessons whenever I teach so that students can use this knowledge to be better prepared for college or work after leaving school. My aim is solely to bring out the best in a student. It would be sharing my knowledge with the students, and gaining knowledge from them as well. Different students from different walks of life have a lot to share, and in some way we can actually teach each other to be better people. When I see students from challenging backgrounds, I find it so heart wrenching that they have to deal with such hardships to get their education. This really opened my eyes to how lucky we really are and inspired me to do all I can to help these students. What do you feel is the hardest part of your job? That would be disciplining students. We as teachers have to be very strict in order to instil discipline in students. When you want to further your studies, being a more disciplined person will definitely get you far. We face challenges when it comes to disciplining students as there are some parents who pamper their children and don’t believe what they’re doing is ever wrong. They will side their child even if the child is wrong. When parents try to intrude on school affairs, it puts a constraint on the teachers as we are prevented from carrying out our job properly. I’m not saying that we don’t accept the parents’ point of view, for we definitely do. When it comes to teaching and disciplining students though, it’s much better if parents allow the teachers to carry out their jobs. If you could change anything about the education system, what would you change? I would hope for a fairer, colour-blind education system. Scholarships should be given to those who really deserve it instead of those who can already comfortably afford to pay for the school fees. It is such a great loss to the nation that those who really need scholarships are sidelined and not given a chance to further their studies. Who do you think has been a great role model to you in your life? My mother definitely played a prominent role in my life. She took care of my siblings and I when we were small, since my father was busy with work. She was the one who brought up our family. My brother has also influenced me greatly in life. I looked to him as a point of reference. When he furthered his studies overseas, it showed me how truly independent he was and inspired me to do the same. How have things changed for you since 10 years ago, and now? Well back then my children were still small, and my mother-in-law was ill with terminal cancer. I had a hard time juggling between work and family, but I tried my best to deliver. I do wish that I could have spent more time with my children though. What do you think of SMK Bandar Utama Damansara (3) (SMKBU3) co-curricular activities? Compared to previous schools, the co-curricular activities carried out in SMKBU3 are excellent. The students here participate very actively in games and sports. Mind you, not all of the uniform sections are active. The fire-fighter cadets and school youth cadets could be improved further. On the other hand, the basketball, volleyball and ping pong clubs in the school are really active and have even won championships before. They need to strive to maintain and improve this standard. In your opinion, what areas of SMKBU3 require improvement? Well there are several areas in which SMKBU3 needs improvement. But first, let me say that I am very impressed by the documentation and administration processes at SMKBU3, especially their aptness at recording successes and achievements. Even so, the discipline factor of this school needs vast improvement. During lessons, sometimes I catch students running around outside of classrooms. When I call them to stop and chase after them, they just run away! Furthermore, the students are very noisy when lessons are being conducted. The whole school seems to be buzzing with noise even when it is lesson time. Students also do not greet the teachers when seeing them in the school grounds. If a student does not even bother to greet their own teacher, then how will they greet visitors or officials? The students also do not give way to teachers and push through to get where they need to be. Now that SMKBU3 has become a cluster school, the types of students coming in should be monitored and controlled. The discipline of the school needs to be raised to an appropriate standard. What are your expectations for SMKBU3? SMKBU3 is already excellent in the games and sports area, and the students should do their best to maintain or achieve greater heights in this field. On the other hand, the students should also work on their behaviour and discipline so that they carry the image of a good school to outsiders and make SMKBU3 proud.